Want to enjoy more energy, feel better, and even extend your life by years? The answer is simple: exercise. The writing is on the wall. Without adequate exercise, your joints will stiffen, your muscles will disintegrate, your lungs and heart will weaken, and you’ll experience an overall poor quality of life. The health benefits of physical activity and exercise are impossible to ignore. Regardless of ethnicity, age, gender, or physical ability, regular exercise benefits everyone. Still not convinced? Keep reading to see why you need to get moving today! Exercise plays a key role in maintaining weight loss and preventing weight gain. Whenever you perform a physical activity, your body burns calories. Naturally, longer or more intense activity results in more calories burned. While regular gym sessions are great, don’t sweat it if you can’t dedicate hours towards exercising each day. Simply try to engage in more physical activity throughout the day. For instance, take the stairs instead of the elevator, dust off the old push mower, or wake up 15 minutes earlier to go on a morning jog. Whatever you do to amp up your physical activity, remember that as is the case with most things in life, consistency is key. If you’re having a hard time getting your snooze on, exercising can help. In fact, several studies have shown that physical activity can help induce and deepen sleep. However, try to avoid exercising right before bed. If so, you may be too amped up to hit the hay and call it a day. Tired from grocery shopping, cooking, cleaning, or doing other day-to-day activities? Regular physical activity will boost your energy and stamina to tackle each day with a smile. Exercise delivers nutrient-rich oxygen to your to your tissues as well as your cardiovascular and pulmonary systems to help them work more efficiently. When the health of your heart and lungs improves, you’ll experience more energy and get more done. Any form of exercise is good, but resistance training or exercising with weights develops the muscles, ligaments, and bones for improved performance, strength, and endurance. 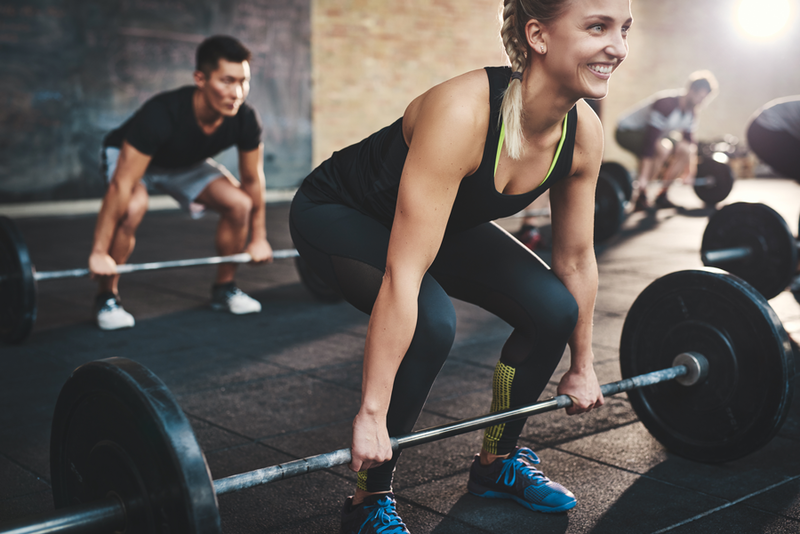 When you exercise regularly with weights or any other form of resistance, your muscles will become more toned, your posture will improve, and you’ll feel as good as you look! Need an emotional pick me up? Have a stressful day and want to blow off some steam? A brisk walk or gym session can definitely help. Physical activity has been proven to stimulate a bevy of chemicals in the brain to make you feel relaxed and happy. Regular exercise may also help you feel better about your looks, which can improve your confidence and boost your self-esteem. Exercising and living a physically active lifestyle can be a lot of fun! Not only does it give you a chance to unwind or get the adrenaline flowing and enjoy the great outdoors, but it allows you to connect with others in a social setting as well. So, rather than have another Netflix night or mundane weekend, take a dance class, join a tennis league, or hit the trails. The trick is to find a physical activity you enjoy. Once you do, you’ll want to do it consistently and even invite friends and family to try it out with you! Even the best exercise programme will only do you good when it’s performed regularly. Frequently disrupting your workout routine and settling into stop-start mode is simply ineffective, and it may even lead to injuries. Therefore, being consistent with your daily exercise routine is right up there with eating a healthy diet when it comes to your weight loss or fitness results. That being said, working out too often or intensely can also have negative effects, such as muscle tears and tendon strains. You’ll be best served by taking a steady, consistent approach to your exercise routine. In addition to keeping you steady and on track, it will help you avoid fitness or weight loss plateaus. A lot of people forget about stretching or convince themselves they don’t have the time. However, flexibility plays a key role in your mobility and overall health, so it’s important to make the time regardless of how busy you may be. Nonetheless, if stretching every day doesn’t jive with your schedule, try to target the same muscles groups at least three times a week. Lifting weights and resistance training should only be done up to three times per week per muscle group. While this sounds limiting, it actually gives you plenty of flexibility in your routine. You can work different muscle groups every day of the week or go full hilt three days a week and work your whole body. Whatever route you take, just remember to give your muscles a break by taking a day off in between muscle groups. If you’re new to working out, begin slowly and work your way up in length and intensity. Three days per week of cardio is safe, effective, and realistic to start. If you have recent experience running, biking, swimming, or performing other cardiovascular exercises, you’re welcome to do more. However, try not to exceed 60 minutes per cardio session or 220 total minutes each week. Any more is simply overkill and may actually hinder your health and performance. Exercise and a regular fitness routine is a great way to boost your health, feel better, and have more fun. For the best results, aim to complete at least 140 minutes of moderate intensity cardio and two days of strength training each week. By doing so and safely ramping up your exercise routine, there’s no limit to what your body can achieve! *Remember to consult your doctor before beginning any new fitness routine, especially if you have chronic health issues or haven’t exercised for a while.